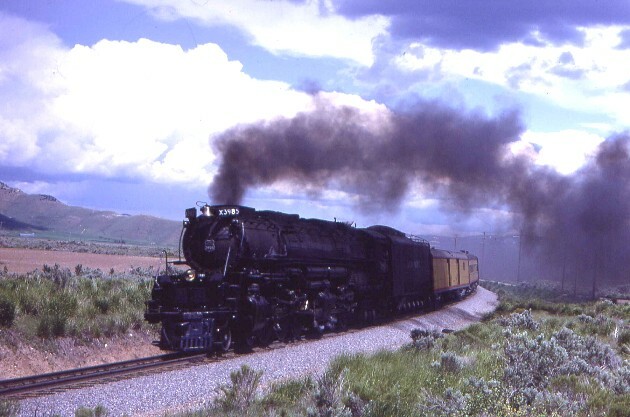 Bruce told me that Union Pacific 3985, the world's largest operating steam engine was going up to Pocatello from its home in Cheyenne, Wyoming for Pocatello's 100 Anniversary and then would pull its first ever fan trip from Salt Lake City to Provo. Bill Compton was interested in coming up for that trip so Bruce got three tickets for that excursion. I took the Desert Wind to Ogden and Bruce picked me up taking me to Pocatello. We scouted locations east as far as Montpelier, Idaho and then went wood cutting. After a down pour the pickup got stuck and Bruce went for help. I almost had gotten it out but we decided to leave it there and pick it up tomorrow. The next day we drove out to Montpelier getting our first picture of the Challenger there, then drove west to our first spot. The train came into view and I turned to see it going away and got a face full of hot ciders. I learned an important lesson for that experience, never look at a coal burning engine after it passed. I cried to wash the ciders out of my eyes while Bruce drove to our next photo location at Alexander. We got great shots there, at Topaz and Inkom. We went back to the pickup truck finding it now very easy to drive so Bruce drove it and I drove the Pinto back to his house. The next morning I caught the Challenger heading to display and later we rode a Union Pacific Family Days Passenger Train from Pocatello to the East Inkom Hold and back. I spent part of that night in the cab of the Challenger listening to the fireman's railroading stories through his years on the railroad. In one word, fascinating! The next day I set up at the East Inkom waiting for the Challenger to arrive and then chased it to McCammon to watch it being wyed. Later at Inkom after the Governor of Idaho had boarded the Challenger it returned to Pocatello. The next morning it headed to south Salt Lake City with us getting two runbys pictures before we drove down to Ogden to pick up Bill Compton. We drove north to Brigham City and picked up the chase catching it four more times before we returned to Pocatello. During the following week Bill and I drove to Salt Lake City to catch the Rio Grande Zephyr leaving for Denver and over to Boise to see Morrison Knudson. Early Saturday morning, the three of us drove down to Salt Lake City for the UP 3985 first public excursion to Provo. We left the UP Station in Salt Lake City and headed south down the streets with plenty of people out chasing the train. At Mount we did a photo runby of the shady side of the train. We then headed to Provo and at the yard south of town wyed the entire train. The train headed back north setting track side fires as it had been very dry in Utah unlike Idaho that had plenty of rain so no fires were started up there. We stopped for another Photo Runby with the engine throwing sparks setting the hill behind us on fire. The engine backed and the wind changed blowing the fire towards the photo line. We moved the line forward three times before the UP 3985 came below. The wind shifted again and as we rounded Point of the Mountain the fire came over the ridge towards us. The train returned to Salt Lake City and after a few pictures of the UP 3985 wying, Bruce drove us back to Ogden where Bill and I waited for the Desert Wind to take us home. Note: A few years later, the Union Pacific's Steam Crew converted the Challenger from being a coal burner to an oil burner which allowed it to be run almost any place on their system which ended most of the track side fire problems. For more pictures of this whole event!